In the early 1900’s many countries, including Japan, Germany, Sweden, Switzerland, Australia and several American states enacted eugenic laws . In Canada, both Alberta and British Columbia passed eugenic sterilization laws . While many states repealed their eugenic policies after the horrors of Nazi eugenics came to light, Alberta aggressively and openly sterilized people without their consent until 1972. Alberta’s Sexual Sterilization Act  was passed in 1928 by the United Farmers of Alberta (UFA) government. It continued under the Social Credit government, whose leader, Ernest Manning had a son (Keith) who was labeled ‘mentally defective’[1, 4]. 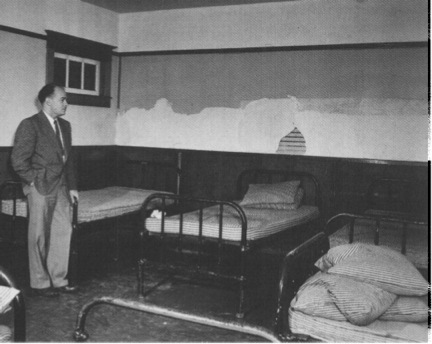 The Act allowed for the sterilization of people in “mental hospitals” as a condition of discharge. Sterilization was administered through a Eugenics Board of four government-appointed members. The original Act required the consent of ‘patients’ or next of kin. Obtaining consent was not always easy so that sterilizations were actually rare, and the increasing poverty and unrest of the 1930’s added to the political urgency behind the first Bill to Amend the Sexual Sterilization Act . This amendment allowed people deemed ‘mentally defective’ or ‘psychotic’ to be sterilized without their consent, and the Board gained the right to consent on behalf of those it judged as incompetent. In practice, this targeted people identified as ‘mentally defective’ (typically with an IQ score of less than 70) or ‘psychotic’ (which was open to diagnostic interpretation). In the end, this meant that most of Alberta’s eugenic victims were people identified – rightly or wrongly – as intellectually disabled or mentally ill. The 1937 Amendment included a provision that strengthened the immunity of surgeons, professionals and Eugenics Board members from prosecution. This permitted the Board to operate without the most basic safeguards or fear of reprisal. 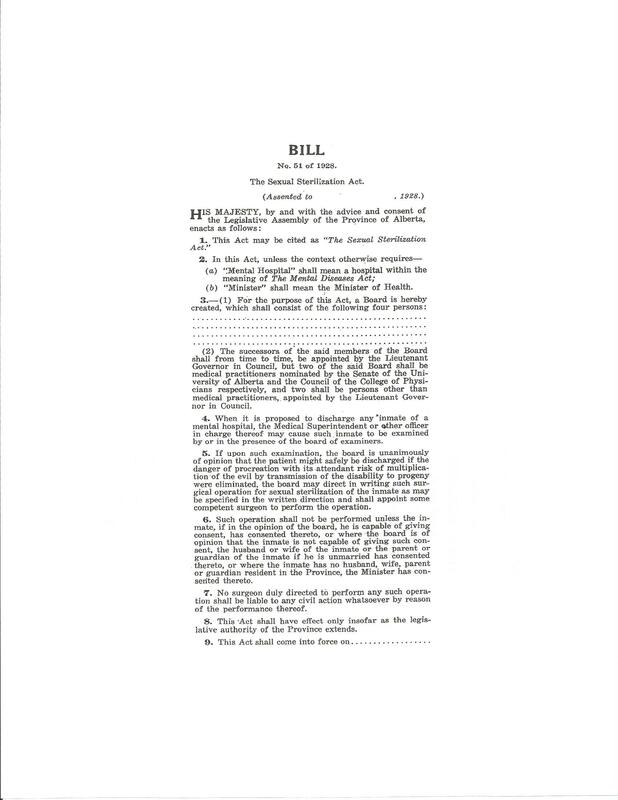 The 1942 Bill to Amend The Mental Defectives Act broadened the kinds of people who could be sterilized to include people with syphilis, epilepsy, and Huntington’s Chorea . In other words, each amendment increased the power and scope of the Eugenics Board. The Eugenics Board operated with virtual autonomy and saw very little turnover, with only 23 different members filling four spaces over its 43 year run. This led to a very routine approach; Board records indicate the average time taken for each of the cases was 11 minutes . By the 1960’s there was an increasing groundswell of media and community protest against the Eugenics Board and the Sexual Sterilization Act. Despite these pressures, the Social Credit Party under Manning held firm, and it was only with the election of a Conservative government in 1972 that Alberta’s eugenic era came to a close . Government of Alberta, The Sexual Sterilization Act. 1928, W. D. MacLean, Acting King’s Printer: Edmonton, Alberta. Government of Alberta, An Act to Amend the Sexual Sterilization Act. 1937, King’s Printer: Edmonton, Alberta. Government of Alberta, An Act to Amend the Sexual Sterilization Act. 1942: Edmonton, Alberta. p. 179-180.